Does Indian Military requires Apex Level Restructuring and Integrated Theatre Commands like US and PLA? A fresh wave of speculations and discussions has triggered recently about Integrated Theatre Commands in India, when some media sources broke the news of notifications wherein an officer of one Service can exercise direct command over personnel of other two Services. The subject is an old debate which reignited after China created Integrated Theatre Commands after major re-organisation in 2016. In this context I am sharing an article of mine published in Synergy Journal of Centre of Joint Warfare Studies, February 2017 Edition, Pages 97-106, addressing this issue in detail. The Indian Armed Forces had recognisable accretions in size and equipment since independence, but the Service specific structure at the top hierarchy and theatre level has broadly remained same, despite lessons learnt from few wars, campaigns and small scale operations. After every war one specific lesson always came out loud and clear, that the military and political hierarchy were not on common understanding in most cases, a credible one point military advice was missing,the joint planning has rarely been optimal, and the synergy amongst all the three services, Intelligence agencies, and other elements of the Government was not in the best form.The concept of so called ‘Jointmanship’ has not worked well, and there has been sub optimal utilisation of resources including logistics.Although having three equally ranked Service Chiefs and each service having its own set of commands, which are not even co-located, may have been a compulsionconsidering the geography/terrain, peculiarities of borders, conventional and sub conventional challenges so far, but with extension of domain of warfare to include strategic arsenal, counter terrorism, cyber, space, information warfare and other forms of operations including out of area contingencies, there may be a need to objectively look at reorganisation of top hierarchy and theatre commands. PostKargil intrusion, The Group of Ministers (GoM)Report, KargilReview Committee Report (KRC), some restructuring to address some of these aspects was done, with formulation of HQ Integrated Defence Staff (IDS), Andaman and Nicobar Command (ANC), and Strategic Force Command (SFC).A plethora of articles have appeared in the media on this subject in the recent past, after Government indicated some consideration about Chief of Defence Staff(CDS), recommended by GoM Report and need for Integrated Theatre Commands.An attempt is being made in this paper to discuss the need, problems, and proposed modelforIndia, after analysing the pros and cons of recentlyannouncedmajor overhaul of PLA of China, a neighbouring military force bordering us,and looking at some other global models. What kind of Military a Nation Needs? The kind of Armed Forces a nation should have, is governed by its National Interest in the existing global and regional political, diplomatic, and security environment, the National Aim derived out of it. The nation has to have a grand strategy in place to achieve the stated Aim, by having a comprehensive national power, and a sound stated Military strategy to achieve it. The kind of Military Hierarchy and Command structure will then be dictated by the roles assigned, the geography/terrain, the threat envisaged, the technological advancements and all the resources of the nation including economic resources. There are some other factors which do affect the Force structuring like weaknesses noticed in existing structures, its existing size, changes in any or all the above mentioned factors of the potential adversary, and the economic cost of maintaining it. Normally a major overhaul is necessitated by lessons of last war, change in National ambition/aim/objectives, change in threat perception, strategic environment, and sometimes internal political and domestic compulsions, technological changes, and change in leadership. Let us apply the above mentioned factors to US Military. US has global strategic interest, aims to dominate the world, and needs an expeditionary military force capable of global deployment, and be effectiveeverywhere. It has no direct military threat to its mainland (leaving aside terror strikes). The institution of Joint Chiefs of Staff has been in place since 1947. However, in 1986, after Goldwater and Nichols DefenceReforms Legislation was passed to ensure closer integration of the US military, leading to evolution of the present structure based in Unified Commands1. The five regional unified commands namely US Atlantic Command, Central Command, European Command, Pacific Command and Southern Command are expected to operate independently, away from the mainland and other commands, sometimes on expeditionary role in designated areas of the globe, require integrated combat power of the three services, which justifies the need of unified commands. They do require some other force multipliers needed to be controlled centrally hence they have functional US Space Command, and the Strategic Command. For Special Operations, a Joint Special Operations Task Force (JSOTF) is formed to plan, rehearse and execute operations regardless of their geographical location. Russians also have four Strategic Commands since 2010, with appropriate allocation of resources from the three Services and independent arms directly under the Centre viz. missile, space and airborne forces, following almost similar logic. The experience of Western models reveal that forced jointness of all combat elements through joint structures, also has problems, because land forces still dominate the war plans, as the notion of “Boots on ground” being more important than precision strike does not go away, because victory cannot be claimed otherwise.In US operation Anaconda, the senior Army Commanders were widely criticised by their air and naval counterparts for not coordinating with them effectively during the weeks preceding the commencement of the conflict, highlighting that unified structures can facilitate forcible co-operation up to a limit, but the true test of actual jointmanship lies in dismantling established mindsets2. and militarily, invest globally to fuel its growth, with an aim to become a Superpower by 2049. In the interim be the most influential regional power; protect its claimed sovereignty, and strategic interests. It also faced a change in threat perception with sabre rattling in South China Sea (SCS) and East China Sea (ECS).After ‘Not so impressive’ performance in conflict with Vietnam in 1979, a similar large scale revamping took place, and thereafter PLA has been continuously modernising its Armed Forces and its war doctrines, based on lessons learnt by other militaries in various wars, because they are yet to fight one to realistically test their operational effectiveness since then. All the other factors mentioned earlier for reorganization, are equally true for China with her growing global ambitions with growing economic muscles, problems in SCS, ECS and Taiwan Strait. Theyneed to have global connectivity to offload trade surpluses and overcapacities, security of SLOC for inflow of energy and raw materials. As a subset of her Grand Strategy, It formulated a well orchestrated National Military Strategy, released in early 2015. Most of these factors can easily be deduced from in depth analysis of full text of National Military Strategy and Belt and Road Initiative (BRI)3 documents, and released in early 2015.An intent of expeditionary design to increase its global footprints, and protect its SLOC and trade interests globally can easily be inferred. The most important factor in addition to the above, in case of China is the growing strength of President Xi Jinping, and his determination to have tighter control of CPC over Armed Forces, besides efforts to curb corruption in Military Hierarchy. The need to cut down numbers and divert funds towards modernization, learning from experiences of US and allies in Afghanistan and Iraq, technological military advances of Defence Forces of other countries, have been a common factors in earlier modernization efforts of China. President Xi Jinping is looking at PLA to be able to safeguard China’s security, maintain global and regional peace4,and have the capability to win wars, should such a situation arise. The overhaul tightens President Xi Jinping’s grip over PLA, who besides being the Chairman of the CPC, Central Military Commission (CMC), also assumed the appointment of Commander-in-Chief of the newly-established CMC Joint Battle Command Centre on 20 April 2016,over-ensuring PLA’s loyalty to CPC5, in context some political and domestic compulsions.With this overhaul at Apex level, the problem of common understanding between political and military hierarchy does not exist, and the problem of single point military advice for political decision making is also taken care of, however this model has a major weakness of over-centralisation, because expecting Xi Jinping to take all major military decision is difficult, and most subordinates may develop the tendency to look at him at the time of crisis. The reorganization of Theatre Commands seems to be in sync with concerns in South and East China Sea and Taiwan Strait.As per the published maps by Chinese media ,PLA has reduced erstwhile Military Regions(MRs), from seven prior to 2015, to five, by merging Lanzhao and Chengdu MRs as Integrated Western Zone/Command/Theatre, and merging Beijing and Shenyang as Northern Zone/Command/Theatre, with no major changes in erstwhile three coastal MRs.The concentration of group armies are therefore likely to be more in the three coastal military commands/ zones, along with allotment of the three Naval Fleets also allotted to them. The teething command and control problems of other services may take large time to resolve, if they have not been completely resolved in US military, having such structures for quite some time. The Western Theatre too large to be managed,having more than one third territory of China, including Indian borders, trouble prone Xinjiang and Tibet,especially when China is engaging in CPEC, and seems to be showing interest in Afghanistan and Iran. In context of India, China will have an advantage of single Command/theatre dealing with operations, easing problems of coordination. Despite modern equipment, modernization, diversification based on experiences of defence forces of other countries, PLA continues to be an operationally inexperienced force (last operational experience in conflict with Vietnam). With such a tight political control, how well will it deliver in operations? The faith in military commanders and decentralized command and control is the key to success in operations. How will PLA perform the role of “Ensuring world peace” listed in their White Papers, with existing force structure? Even their modernization trajectory does not give them this capability at least for next two decades, especially in Naval and air component of PLA, in comparison with US. The impact of overhaul of Dragon Army on military posturing in the region, with global ambition can only be gauged after few years, hence drawing lessons from them may not be appropriate. Let us analyse theIndian Apex leveldecision making structure and Model of Theatre Commands, in the manner we analysed for US and China above. India, a fast growing economy,seems to be having the National Interest of peaceful development, inclusive, growth, and has indicated no expeditionary interest so far. It needs a grand strategyto have comprehensive national power, to be able protect its strategic interest, strategic choices, sovereignty, maintaining peaceful periphery, and protect its growing area of interest. There being no structured National Security Strategy in public domain, there are many contradictions in decision making for security for the country. As per Know India, Indian Armed Forces in National Portalwebsite8, the President is Supreme Commander of Armed Forces, but has no powers to formulate policies for security. The responsibility for national defence rests with the Cabinet, discharged through inclusiveMinistry of Defence, providing policy framework and wherewithal to the Armed Forces for the defence of the country.The contradiction starts from the fact thatexcept for Line of Control with Pakistan, the entire land borders of the country are being manned by Para Military Forces, operating directly under Home Ministry, and not Armed Forces/Defence Ministry. The Home Ministry, directly responsible for internal security, is involved in borders, and conversely the Military is increasingly getting involved in internal security. The intelligence agencies are getting coordinated at the level of National Security Advisor, who also gets increasingly involved in External Affairs, becomes overly burdened and powerful to call the shots in all security matters including Defence without being trained for it.In such a complex arrangement, one point professional military advice directly to National Decision makers is rarely possible, but is an utmost necessity. Should be a four star General, first amongst Service Chiefs, equivalent to Cabinet Secretary, invitee to CCS. The Defence Secretary should continue with existing responsibilities of peacetime policy making and providing wherewithal hitherto fore,and the operational matters including rendering military advise to Defence Minister and CCS should be dealt by the CDS. The CDS should also be responsible for Joint operations, Out of Area Contingencies, Military operations other than War(MOOTW) and asymmetric warfare, with a priority right over common resources, in consultation with Service Chiefs for any type of joint operation. The organizations under CDS should be treated at par with Fourth Service. 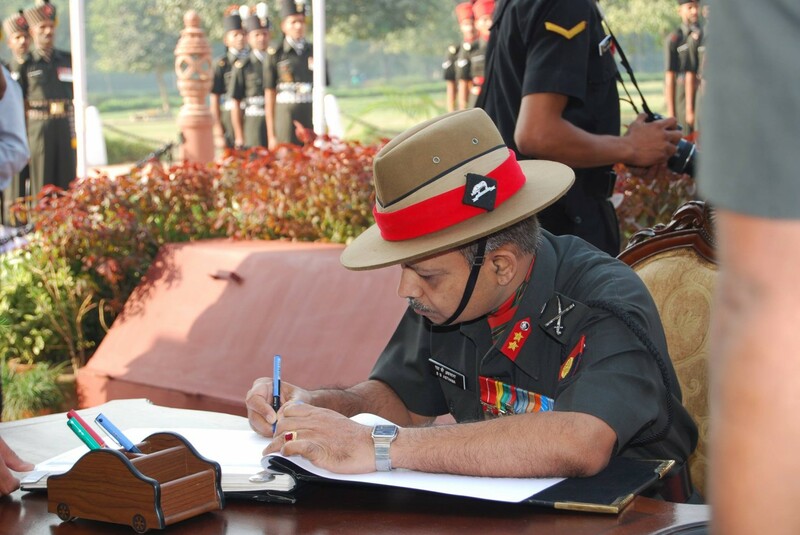 National Command Centre should serve as the operation Headquarters for CDS. The existing CIDS Headquarters, and all organizations under CIDS, along with the functions being performed by them should be placed under the CDS and all the current responsibilities of CIDS like Joint Planning(Formulation of Long Term Integrated Perspective Plan), joint intelligence (DIA), centralized procurement planning, budgeting, and other similar tasks being performed by CIDS,should become part of his responsibilities, and the CIDS should become his Deputy Commander to ensure ease of transition. The SFC should be placed under the CDS, with no change in the existing arrangements for use of strategic/ nuclear weapons. Should bring minimal changes to the existing organizations, status and powers of the Service Chiefs; yet achievejoint strategic planning and desired integration. Indian geography, border commitments, Counter insurgency/terrorism involvements, threat perception and military resources has led to formulation and location of Service Commands in the manner they are currently disposed on ground. Amongst Army Commands, except for Southern Command, not many operations with Navy are visualised, unless some formation is picked up for Out of Area Contingency Tasks or MOOTW. In case of Southern Command also, a major responsibility of Andaman and Nicobar and islands in Bay of Bengal has been taken away by correctly raising the Integrated ANC. In most cases the Indian Navy is looking after Indian Maritime interest from Malacca Strait to Gulf of Eden, largely with its currently organised Naval Fleet Commands, in coordination with Coastal Guards for coastal security, and Indian Air Force (IAF). The IAF has the flexibility to mobilize the required No of aircrafts at the point of application which is more relevant than the co-location. To coordinate that a skeleton integrated staff has already been co-located with all these Command Headquarters, with some elements at Corps Level. The distances in Indian theatres are not as large as US integrated theatres; hence the requirement of co-located Air Force is more critical in their case, in comparison with India. India does not have the luxury of adequate IAF resources to be allocated to Army/Naval Commands ab initio, hence switching of IAF resources is a must for their optimum utility. IAF like other Services is a National Resource, with many other national commitments besides being exclusively available for Army/Naval Commands. With no major change in geography, border commitments, counterinsurgency/terrorism involvements, threat and military resources we should not disturb the existing structure of Service Commands. We can think of Integrated Theatre Commands after we have adequate air resources and there is a major change in some or any of the factors mentioned above.One major factor which is changing rapidly is Technology, especially in Information Warfare domain; hence the paper fully endorses the raising of Information Warfare Command, with cyber as a component and a Space Warfare Command. At national level there are various ministries looking after various components of logistics including military logistics, however the coordination for military logistics is being done by Ministry of Defence (MoD).Major military powers across the world have steadily integrated their military logistics for enhancing efficiency and rationalisedefence spending.Indian Military has majority of logistics as Service specific component, and has a very limited component on Joint logistics model like Medical services, MES, DGQA, DRDO and few more organisations, which is not a cost effective model.This aspect will need to be addressed by introducing incremental changes towards commonality in logistics functions. For instance, it’s not cost effective if in one military station there are three supply chains working and meat being procured at three different rates for three Services. To ensure efficient logistics system, national logistics assets under various Ministriesrelevant for military,need to be integrated with all the Services through MoD. China has adopted it successfully, where almost 80 percent of PLA logistics is joint, and only 20 percent is Service specific, which has proved to be quite cost effective. CDS can be an important bridge between Ministry of Defence and Service Headquarters.The ‘Defence Logistics Cell’ which interacts with respective service Headquarters can be placed under CDS, to coordinate the Integrated Logistics System. It was apprehended in case of PLA that it may not be easy to train the integrated Theatre Commanders; the same logic is true for CDS and other commanders handling joint forces in Indian Army. Except for Defence Services Staff College, a small capsule at Army War College, and NDC, there is very little joint training being conducted in Services. We need to expand and utilise Tri-Service organisations like CENJOS, USI of India and NDU to organise more Joint Training Courses for all Services to promote integration. The model of having a CDS to give single point military professional advice to the National Decision makers, and having integratedTheatre Commands, has been successful in many countries. China has also adopted the idea of Integrated Theatre Commands, but India should adopt only those changes which suit us, in light of our peculiar geography/terrain, threat perception, peculiar challenges, resources and technological threshold. The paper recommends empowered CDS and not glorified CIDS, no change in existing Service Commands for the time being, and supports the proposal of Information Warfare Command with Cyber capabilityas a component, and proposed Space Warfare Command and Special Operation Command. 1. Gokhale Nitin (2016), Theatre Command and CDS: The debate continues, NewsWarrior, April 24, 2016. 2. Bahal A S (2006), Theatre Commands,Indian Defence Review, Jan-Mar 2006, Vol 21(1),pp 78. Sharma B K et al (2016), Analysis of China’s Military Reorganisation, USI Occasional Paper No 2, 2016.